Yikes that's cold! I mean, don't get me wrong, I like the cold. But it all happened so fast, didn't it? I feel like fall -- my favorite season -- gets shortchanged, lost in the shuffle: It doesn't really get going until mid-September, and by November 1 there are already holiday commercials popping up. Then, before you know it, you find yourself paralyzed with cold, shivering in the darkness of 4:45pm. BUT, there is much joy to be found in our new season, if you can somehow roast that mind-shattering chill out of your bones. How, you ask? Simple! Get cozy. An Irish pub is a nice place to get toasty, tucked away from the cold clutches of Old Man Winter. A little place like the Irish Village in Brighton, say. Protected from the elements, nestled up next to friends or dashing strangers, you're getting warmer already. Sip a butterbeer. Or any malty brew, really. Such as Kona Pipeline Porter or Sam Adams Winter Lager. Yum. Both available (I think) at the Irish Village. If you happen to duck in there, I mean. Warm your heart. Nothing cheers the soul quite like music does. It can melt the coldest of hearts. And what kind of music evokes the most cheer of all? Why, Christmas carols of course! 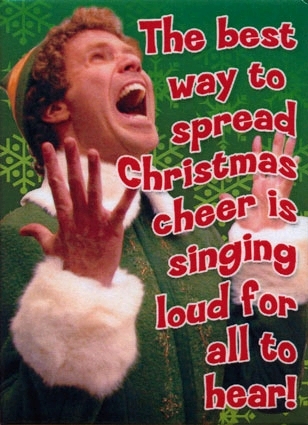 Just ask Buddy the Elf! All this is to say that Edgar and I -- a.k.a. The Decks -- are playing at the Irish Village on Thursday night, with Meg Smallidge and Jeff Harris. We'll be celebrating the season in holidazzling fashion, performing Christmas carols, favorite songs and some originals too. You should come! Wishing you all a merry Christmas, happy Hanukkah, and a happy new year!